This easy Mint Infused Vodka is adapted from Joni Newman’s Vanilla Mint Vodka recipe from Vegan Food Gifts. You can also infuse rum instead of vodka and have it mojito ready! It seems too early to start making holiday gifts, but summer is when the best herbs are ready to be used. Plus you get to have all your holiday gifts ready before the leaves start to change. You could make a ton of variations on this recipe. Try making lemon vodka by using lemon verbena or lemon balm in place of the mint. The next one I’m trying out is lemon thyme vodka using lemon herbs and mint! Below is a photo of Joni Newman’s Vanilla Mint Vodka from her amazing book, Vegan Food Gifts. This is another great holiday present and you can get the recipe here. 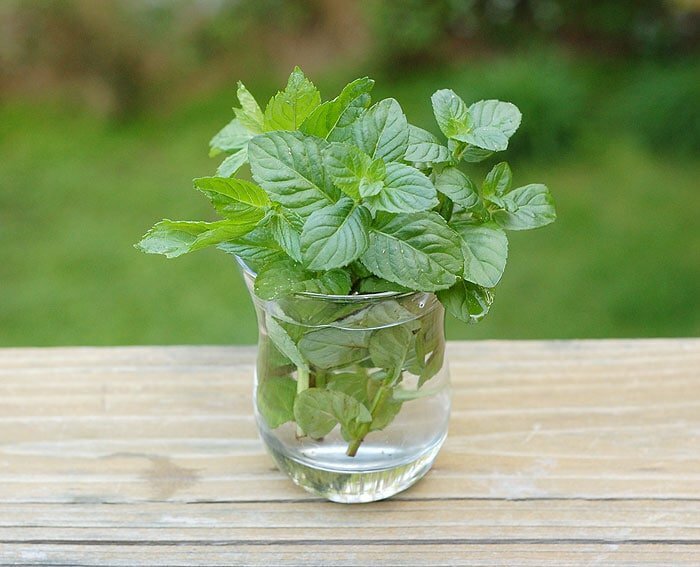 Use the bounty of fresh mint in your garden to get ahead on holiday presents. This takes almost no effort and all your friends and family will be thrilled to get one! Add all ingredients to a mason jar with a tight lid and shake. Allow to steep in a dark place for 5 full days. Shake once a day. Strain through a fine mesh strainer and put in the bottles you'd like to store or gift in. 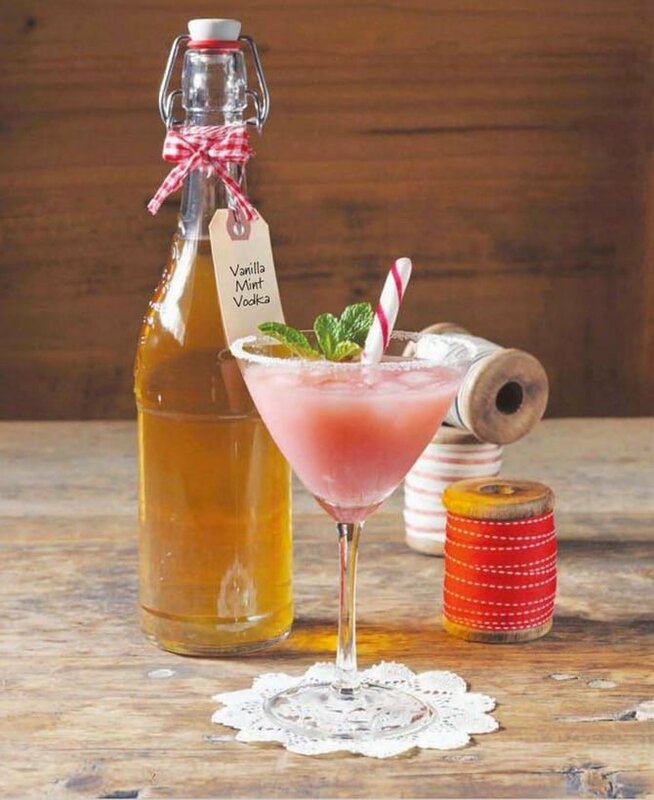 See Joni Newman's gifting suggestions in her recipe for vanilla mint vodka. I never thought of creating my own flavored vodka but mint would be a perfect place to start. Seems simple enough. Thanks. yep – we have a BUNCH of mint to be used, I love this idea! I totally need to try this with tequila! Vodka and I don’t get along too well. I keep meaning to make my own infused vodkas, and I love the idea of mint infused vodka! I can think of some friends who would love this as gifts as well. Thanks! You had me with easy on this recipe. I have a large bottle of vodka in my pantry just begging to be used. I’m not much of a drinker so this would make a cool gift. Thanks for the idea! Ok, I actually have TONs of Mint in my backyard and never thought to steep it in Vodka! Perfectly genius! Love this! I have the vodka and tons of mint. Headed out to pick some mint now. Thanks!!! I find that this method easily creates a product that tastes like grass. This is because the mint breaks down very fast like basil would. Instead, I put the vodka in the freezer. Once it’s really really cold, I mix it with the mint and pop it back in the freezer. The freezer infusion ends up with all the mint notes (such as the chocolate note of chocolate mint or the lemon note of Hillary mint), so you don’t just end up with a menthol cough syrup (or mouldy hey perfume). It has to be left in the freezer to infuse for a lot longer, though. Then strained and put in a bottle (or drunk straight from the jar in big gulps). Never did alcohol breath smell so delightful!